Eno River begins in northwest Orange County, flowing eastward approximately 33 miles until, along with the Little and Flat rivers, it forms the Neuse and flows into Falls Lake. The Eno"s waters roll through wilderness passing historic mill sites, river bluffs covered with flowering shrubs and fords used by early settlers. The river can run as swift as the wind and as gentle as a blowing breeze. But, upstream, rapids smash against rocks in the river"s path. Further down, the Eno meanders quietly through serene surroundings. The valley of the river is narrow and steep-walled. The rolling landscape is carved and sculpted by swift-flowing water. 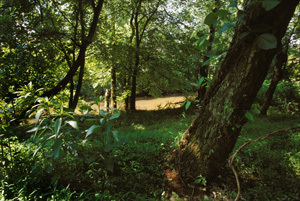 Eno River State Park lies here, in the beauty of more than 2,600 acres of natural resources. Five access areas Cabe Lands, Cole Mill, Few"s Ford, Pleasant Green and Pump Station offer entry into this largely unspoiled river environment. Family camping: Follow a secondary trail off Fanny"s Ford Trail to reach the primitive family campsites, approximately one mile from the camper parking lot in the Few"s Ford access area. Five sites offer tent pads and a pit toilet. Due to the remoteness of the area, open fires are not permitted; fires are restricted to camp stoves. Obtain a camping permit at the park office where sites are assigned on a first-come, first-served basis for a modest fee. Group camping: To reach the group camp, follow the trail from the camper parking lot at Few"s Ford and cross a swinging bridge over the river to a shady, wooded ridge. The area has five tent pads and two fire rings, and the camp accommodates a maximum of 26 people. Benches, a fire pit and pit toilet are provided. Reservations are required for group camping, and a modest fee is charged. Travel the Eno by canoe and encounter Class I, II and III rapids. Canoe access points are located in several areas of the park. Wear a life vest at all times, and please respect the rights of private land owners along the river. Canoeing is best after a rain, which slightly raises the water level. Levels are measured on gauges on road bridges. The best canoeing levels are one to three feet. Levels below one foot require some portaging while levels above three feet are dangerous. Information on river conditions and put-in/take-out locations may be obtained at the park office. The best rapids are located between Hillsborough and Roxboro Road in Durham. The river continues at a slower pace from there to Falls Lake. Watch for dangerous hydraulics below the Pleasant Green Dam. Rangers hold regularly scheduled educational and interpretive programs about Eno River State Park. 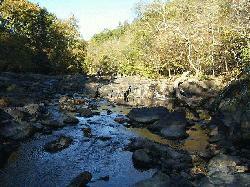 To arrange a special exploration of Eno River State Park for your group or class, contact the park office. Educational materials about Eno River State Park have been developed for grades 5-7 and are correlated to North Carolina"s competency-based curriculum in science, social studies, mathematics and English/language arts. The Eno River program introduces students to the Eno River and focuses on water quality, indicator species, water testing, watersheds, aquatic sampling, resource management and stewardship. Accompanying the program is a teacher"s booklet and workshop, free of charge to educators. Wet your line in one of the best fishing streams in the Neuse River basin. From the river banks you can catch largemouth bass, bluegill, chain pickerel, crappie and bullhead. The river is also home to Roanoke bass, known as red-eye, which is found only in the Eno-Neuse, Tar, Chowan and Roanoke rivers. All Wildlife Resources Commission fishing regulations are enforced. 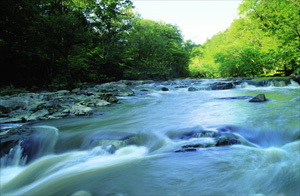 Occoneechee Mountain, a nearby state natural area that is a administered by Eno River State Park, also offers fishing. Follow the river bank, journey through the woodlands or hike a short nature trail for a closer look at Eno River State Park. Hike Cox Mountain Trail for a challenging climb through a scenic hardwood forest. Travel along Bobbitt"s Hole Trail to one of the most scenic spots in the park, a place where water rushes around rocks and greenery overhangs stone-lined bluffs. 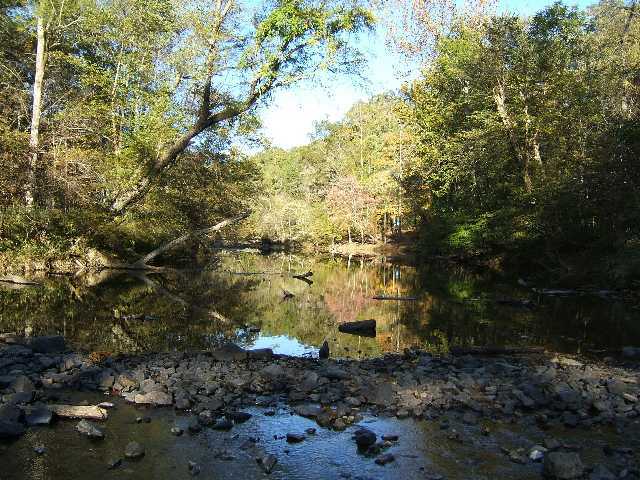 Eno River has approximately 21 miles of trails where you can enjoy nature at its best. All trails are blazed. See the park map for information on distance and difficulty. Two picnic areas provide the perfect spot for enjoying a meal in the open air. One of the picnic grounds is located in the Few"s Ford access area, adjacent to the parking lot. Few"s Ford has 20 picnic sites, 10 of which are handicapped accessible. An accessible water fountain and restrooms are nearby. A 12-table picnic shelter with a fireplace and grill is also accessible and can be reserved for a fee. The Cole Mill picnic area, nestled in a wooded setting, includes 10 tables and four grills with drinking water and restrooms nearby. A group picnic area includes three tables and grill. Cole Mill also has a wheelchair-accessible picnic shelter with eight tables and a grill. The shelter may be reserved for a modest fee. *Park opening and closing times refer to Few's Ford Access. Cole Mill Access opens at 9 a.m.; Pleasant Green and Cabelands accesses open at 8:30 a.m. These accesses close 30 minutes prior to the closing times listed above.